We talk with David Margolick about his groundbreaking examination of the relationship between Bobby Kennedy and Martin Luther King, Jr. The book is The Promise and the Dream. Then, Alex Perry discusses his book, The Good Mothers: The True Story of the Women Who Took on the World’s Most Powerful Mafia. It’s a feminist saga of true crime and justice that shows the power of women, even against the most ruthless of enemies. In the America of the 1960s, no issue was more vital than civil rights — and no two public figures were more crucial in the drama of race relations in this era than Martin Luther King, Jr. and Robert F. Kennedy. 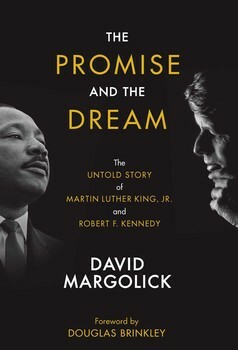 Fifty years after they were both murdered, noted journalist In The Promise and The Dream, David Margolick explores the untold story of the complex and ever-evolving relationship between these two American icons. Assassinated only sixty-two days apart in 1968, King and Kennedy changed the United States forever, and their deaths profoundly altered the country’s trajectory. In The Promise and the Dream, Margolick examines their unique bond and the complicated mix of mutual assistance, wariness, antagonism, and admiration that existed between the two. David Margolick is a contributing editor at Vanity Fair. Prior to that, he was a legal affairs reporter at the New York Times, where his work was nominated four times for the Pulitzer Prize. In addition to The Promise and the Dream, he is the author of many books, including Strange Fruit: The Biography of a Song. We’ve all heard of Sicily’s Cosa Nostra. But under the radar of most of us, an even more powerful Mafia has spread its tentacles throughout the globe: the ’Ndrangheta of Italy’s Calabria. It underpins — or undermines — the global financial system and is the major player in the international arms and drug trades. The N’Dragheta maintains its iron grip by horrific violence, brutal misogyny, and cult-like indoctrination of its children. The ’Ndrangheta has perverted the family to create one of the greatest criminal syndicates in the history of the world. But three courageous mothers and one fearless female prosecutor risked their lives to fight back — and ended up sparking a movement. 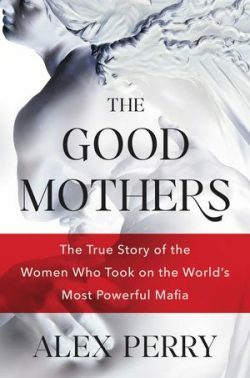 Alex Perry tells their story in his riveting book, The Good Mothers: The True Story of the Women Who Took on the World’s Most Powerful Mafia. It’s a feminist saga of true crime and justice that shows the power of women, even against the most ruthless of enemies. Alex Perry is a writer and correspondent. In addition to The Good Mothers, he’s the author of three other books. His journalism has appeared in The New Yorker, The Guardian, TIME, Newsweek and others.